Discover our different workflows for untouched isolation of tumor cells and find the one that fits your experimental needs. 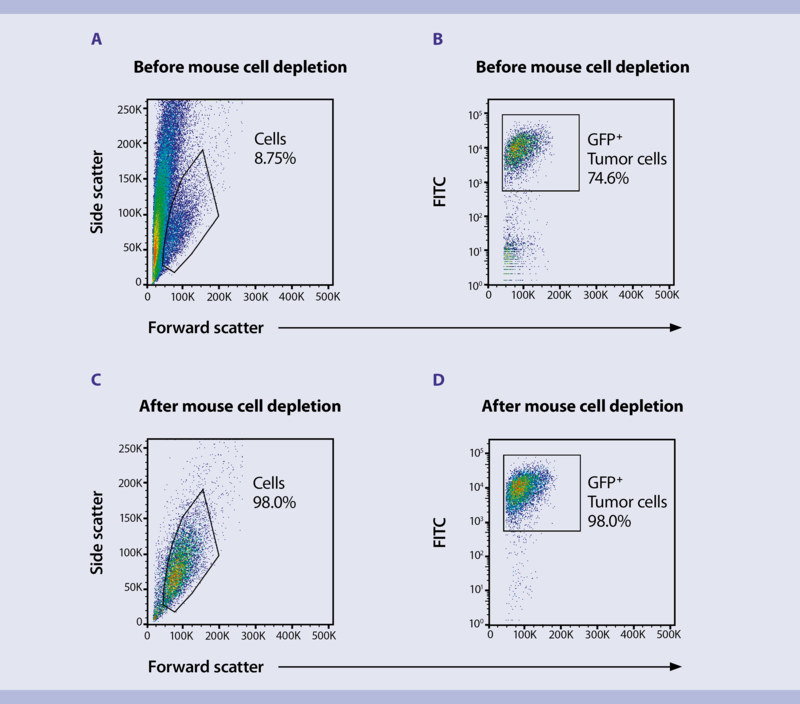 Gentle tumor dissociation is a prerequisite for efficient downstream cell separation, analysis, or culture. gentleMACS™ Technology ensure rapid and standardized dissociation of tissue samples into single-cell suspensions. Need to store freshly dissected tumor tissue? The MACS® Tissue storage solution enables storage of tissue for up to 48 hours without compromising viability or causing unwanted effects like cell activation or apoptosis. Depletion of non-tumor cells from dissociated tissue is essential for receiving pure tumor cells of interest. 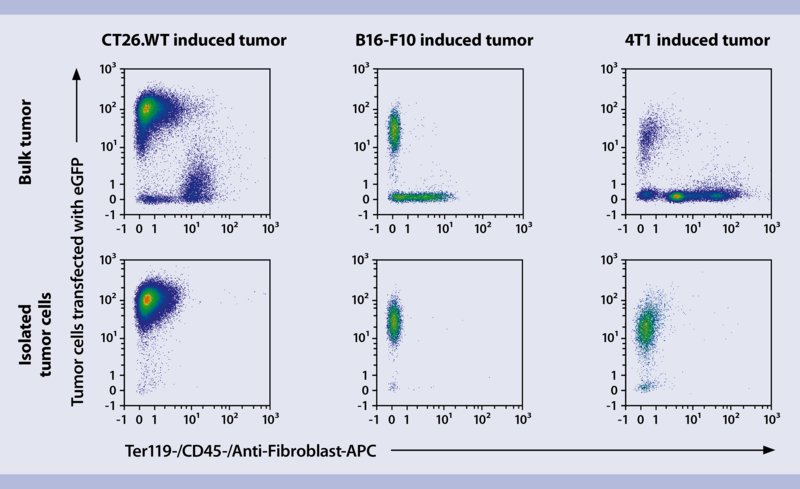 Based on comprehensive screenings on primary tumor material, cell lines, and health tissues, we have defined combinations of antibodies recognizing all cells of the tumor microenvironment but not the tumor cells. Using these antibodies coupled to MicroBeads can eliminate >95% of contaminating cells in less than 20 min. Depletion of non-tumor cells from dissociated primary tumors can be performed by magnetic cell separation using the Tumor Cell Isolation Kit (TDK), human. 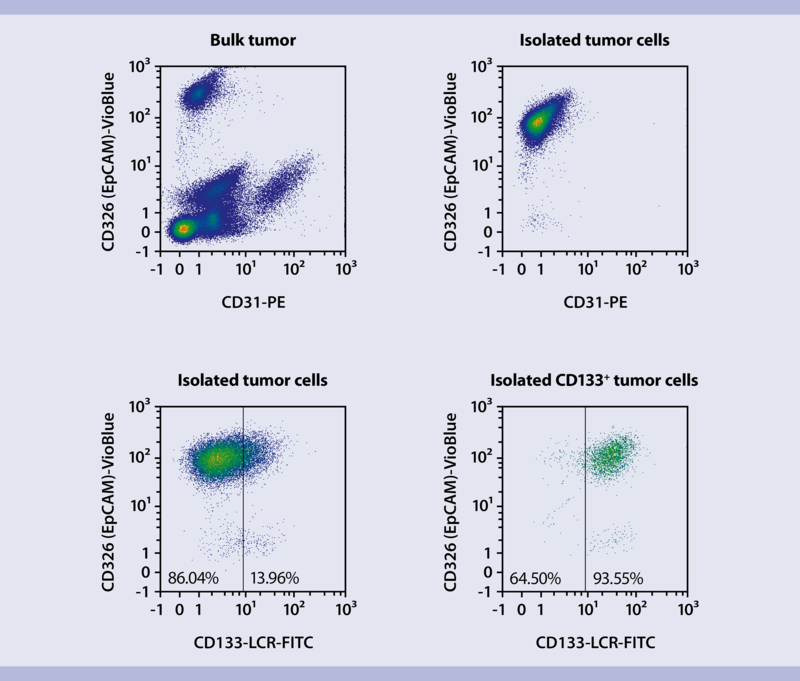 As the isolated tumor cells are untouched, subsequent tumor subpopulations can be isolated by MACS® Technology as shown for the isolation of CD133+ cancer stem cells. Ovarian carcinoma tumors were dissociated with the Tumor Dissociation Kit, human and the gentleMACS Octo Dissociator with Heaters. The depletion of non-tumor cells from the dissociated primary tumors was achieved with the Tumor Cell Isolation Kit, human. Purified untouched tumor cells were obtained with >95% elimination of contaminating non-tumor cells (A). Untouched human tumor cell isolation from ovarian carcinoma pleural effusion samples containing low initial frequencies of tumor cells allowed for subsequent isolation of tumor subpopulations by MACS Technology as shown for the isolation of CD133+ CSCs (B). The Mouse Cell Depletion Kit effectively removes post-dissociation debris and depletes infiltrating mouse cells from human GBM cells in PDX models. This delivers untouched human tumor cells with a purity of 98%. Flow analysis of dissociated PDX brain tumor samples before and mouse cell depletion. (A) Before mouse cell depletion 9% of all events were gated as cells. (B) Of the events gated as cells, 25% were infiltrating mouse cells. (C) After mouse cell depletion, 98% of events were cells. (D) Human tumor were purified to 98%. Using the Tumor Cell Isolation Kit, mouse untouched tumor cells can be isolated from bulk tumors. 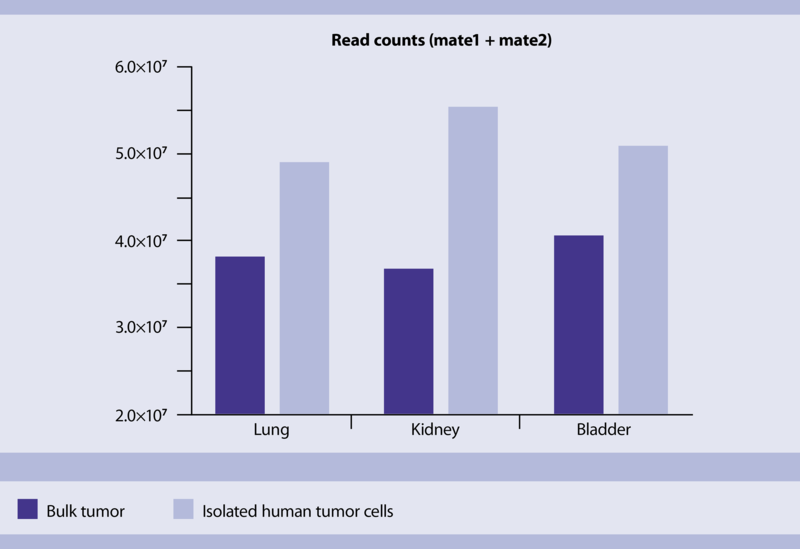 As the antibody cocktail was developed to deplete unwanted non-tumor cells, the isolation is independent of tumor-specific surface markers. CT26.WT, B16-F10, and 4T1 syngeneic mouse induced tumors which were induced by GFP-expressing cell lines, were dissociated with the gentleMACS Dissociator Octo with Heaters and the Tumor Dissociation Kit, mouse. The samples were then incubated with the Tumor Cell Isolation Kit, mouse to deplete the unwanted non-tumor cells. Listen to the lecture delivered by Dr. Olaf Hardt during Tri-Con 2016 at the Moscone North Conference Center, San Francisco, CA, and learn more about isolating pure tumor cell populations from primary tissue for improved downstream analyses using MACS® Technology. Join Dr. Carsten Studte and his webinar on the isolation of cells from tumor tissues, including the optimized and automated dissociation of solid tissues. Depletion of unwanted cells from cell populations improves analysis as well as culture of target cells. Fast and easy magnetic separation using MACS MicroBeads allows for accurate downstream analysis avoiding bias caused by contaminating cells. Depletion of contaminating mouse cells allows for accurate downstream analysis of human tumor xenografts by next generation sequencing. Untouched isolation by magnetic separation is easy and fast (<20 min) and can be used for all kinds of xenografted human material without the need for a positive marker expressed on human cells. The sialyl-glycolipid stage-specific embryonic antigen 4 marks a subpopulation of chemotherapy-resistant breast cancer cells with mesenchymal features. Aloia, A. et al. (2015) Breast Cancer Res. 17(1): 146.